SDSM wiped out the Republic of Macedonia in front of the eyes of the children, in front of the pupils’ eyes. With no sense of statehood, on January 31, the municipalities in the Republic of Macedonia received guidelines from the Government, followed by an order to delete the name Republic of Macedonia from the school buildings. And again in the public lie, they say they will wait, with some kind of plan about the changing of the signboards. 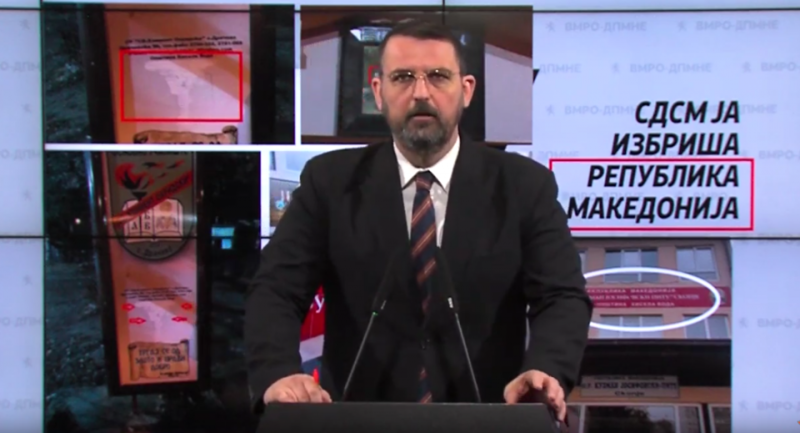 In fact, the secret attack on the name of the Republic of Macedonia has already started, starting from the schools, the spokesman of VMRO-DPMNE, Naum Stoilkovski said on Friday. Behind me, there are few photos of destroyed signboards in Kisela Voda and Dracevo in Skopje, where the name Republic of Macedonia has been scratched, repainted! According to our sources, this “black action” was followed by a reaction of part of the teachers and parents. “Order to erase, cross, scratch the name of the state, the Republic of Macedonia, and the place to remain blank with visible traces of violence and forcible erasure, covering the letters. Same as dealing with a shameful message on a school wall. This black action to erase the Republic of Macedonia from the institutions, from the schools is contrary even to the capitulation [agreement], where it is said that the change will be active after Greece signs the NATO membership protocol, so that there are several more agreed processes, a note from and to Greece, reporting to the UN. They know this, but SDSM hastened to erase the Republic of Macedonia as early as January 29. This is the order, adopted at the government session held on January 29, sent to municipalities on January 31, after which it was acted immediately,” said Stoilkovski. According to him, it is the protected identity and affirmation that Zoran Zaev and the cartel brought to the Republic of Macedonia. “A few days ago we presented a document that Zaev and the cartel agreed with a Kosovo interstate document with North [Macedonia], even before the referendum in September took place, now they delete the name from the school buildings before the deadline set by them, agreed by themselves! Unfortunately, this is only part of the long-term consequences of accepted conditions with the capitulation accepted by Zaev, Stoilkovski pointed out. VMRO-DPMNE promises to do everything in its power to change in the future the processes arising from the capitulation agreement signed in Nivitsi.